The Village Clubhouse party/meeting rooms offer Greenwood residents two venues for private events. Both rooms are equipped with kitchen facilities, sound systems, tables and seating. The smaller Garden Room, located under the deck in the front of the building, looks out onto the Clubhouse Garden. It holds up to 50 people. 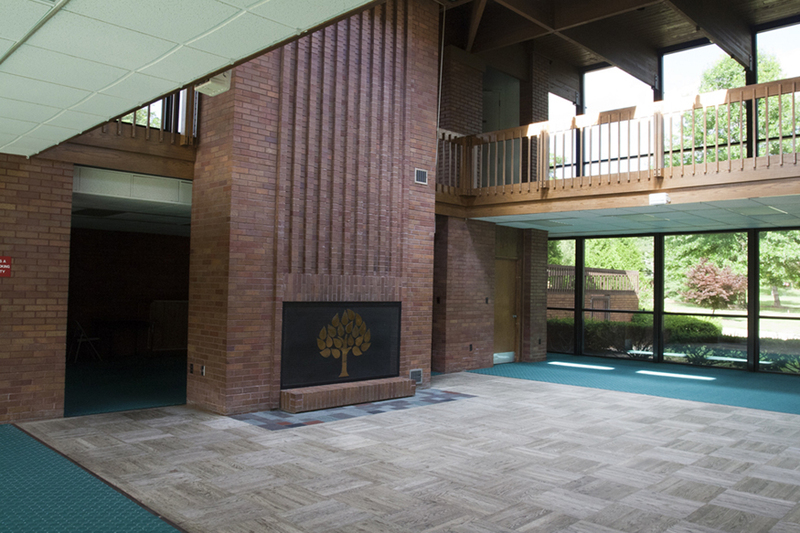 The larger Community Room faces Marshall Lake and includes a balcony that over looks the lake. This room holds up to 125 people. The rooms can be viewed by appointment during office hours. Each room has its own kitchen and separate entrances. The two rooms are available for rent by village residents only. Rooms can be reserved by calling the GVCA office at 330-467-7036. Rental fees include the room rental rate, a cleaning fee, an hourly security guard fee and a security deposit. A portion of the security deposit is required within two weeks of reserving the room. The remainder must be paid no later than three weeks prior to the event. The security deposit is refunded when the keys are returned, security guard costs are assessed and damage assessments are completed. Renters need to be aware of the responsibilities incurred in renting the party rooms to ensure the facilities are maintained in a condition to which that all residents can be proud. These ‘common sense’ Rules of Usage, are part of the rental contract and are summarized below. Only a permanent owner/tenant of a Greenwood Village residence is allowed to contract to rent a GVCA party room. Events are confined to family functions and the renter is liable for all damage during the rental period. The rental period begins at 10:00 am the day of function and ends at 1:30 a.m the following morning. Keys must be picked up by the resident renter during office hours the last business day before the function and returned to the office on the first business day following the event. There is a charge for lost keys. In the event of violations/damages, charges are determined by the GVCA office and billed against the renter. Disputes may be appealed to the GVCA Board of Trustees. A security guard hired by GVCA will be provided for the event to aid in running the function The guard has the authority to call for more security guards, shut down the party or call the police if he feels the situation warrants it. He may also call for medical assistance if necessary. All vehicles must park in the clubhouse lot (86 places) since Sagamore Hills prohibits street parking. Overnight parking in the lot is prohibited and vehicles will be towed Cost of towing and storage is the responsibility of the vehicle owner. Special parking exceptions can be obtained from the office. Functions are confined to the rented room(s). Use of the sound system/microphone is arranged through the GVCA office ONLY prior to the function. The sound system is a separate item with a separate deposit and signed addendum to the party contract. The fireplace in the Community Room is a non-working decorative fireplace only. Lighted candles or open flames anywhere in the room are prohibited. Decorations/Signs/Balloons are limited to the interiors of the rented rooms. Tacks, tape (including duct tape), glue, nails, etc., are prohibited.String may be used to affix balloons and decorations. Confetti, glitter, flower petals, rice, and ice sculptures are prohibited. Alcohol is permitted in the building but Resident Renters are responsible for their guests and assume liability. Underage drinking is grounds for immediate termination of the function and loss of future rental privileges. This is a residential area so music/performances must be kept to a moderate level. Residents, or people renting the adjoining party room, can call the police, who will come and shut down your event for disturbing the peace. Keeping the doors shut will help you avoid this situation by containing the noise inside the building.